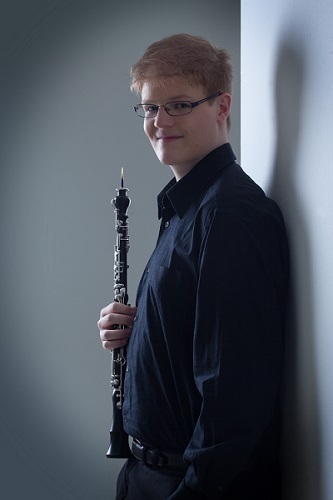 Sebastian Breit, born on January 26th 1998 in Vienna, began his musical studies at the age of 6 and started playing the oboe at age 8. Since 2015 he is studying at the Universität für Musik und darstellende Kunst Vienna with Univ.-Prof. Harald Hörth. Since 2009 he was awarded several first prizes at the Österreichische Jugendmusikwettbewerbe prima la musica competition, also at the Eli Freud competition, the Jürg Schaeftlein competition, the Wolfgang Zimmerl competition and the Richard Baumgärtel competition. Also he is the winner of the “Lions-club Nachwuchsstipendium 2017”. Sebastian has accumulated vast experience in orchestra and chamber music in many orchestras like the Radio Symphony Orchestra Vienna and ensembles with members of the Vienna philharmonic orchestra, the Vienna symphonic orchestra and Ensemble Modern. He played under conductors like Guido Mancusi, Fabio Luisi, Lucas Vis and Christian Thielemann. He also has a great interest not only in contemporary music but also jazz and pop music. Sebastian got important musical influences from Paul Kaiser, Charlotte Brusatti, Christian Hommel and Celine Moinet. He is supported by the talent promotion program of Österreichische Jugendmusikwettbewerbe prima la musica competition, by the Eva Lind Musikakademie Tirol and the “Musica Juventutis” program of the Wiener Konzerthaus. Concerts have brought him to Germany, Denmark, Slovakia, Montenegro and the USA. If you are interested in working with Sebastian, please get in touch with the EMCY Office.